Richard Miranda is a member of the DPM External Advisory Committee. 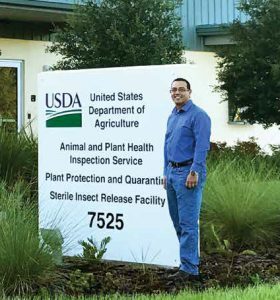 Richard Miranda is the Florida State Plant Health Director (SPHD) for Plant Protection and Quarantine (PPQ) within the USDA-APHIS. PPQ spans the entire United States, with Directors in each state working to safeguard agricultural and natural resources. In Florida, PPQ is a team of 340 employees. There are four regional areas throughout the state, and two statewide programs (the Citrus Health Rresponse Program and the Fruit Fly Exclusion and Detection Program). The Area and Program directors report directly to the SPHD. Overall, the responsibility of the SPHD is to prevent entry of pests and diseases of economic concern into Florida and the United States, and to stop the interstate spread of pests that are already present in Florida. There are two sides to PPQ’s role in pest interception: the international side and the domestic side. On the international front, PPQ conducts agricultural quarantine inspections to intercept pests on propagative plant material entering the U.S. Customs and Border Protection employees inspect agricultural imports and passenger baggage, and any pest of concern is sent to PPQ for identification. PPQ will make regulatory decisions based on what is found. In addition, PPQ facilitates the export of agricultural commodities by providing phytosanitary certifications. These certifications fulfill the phytosanitary requirements of receiving countries so that growers are able to sell their commodity to other countries. For example, China requires all pinewood shipments to be fumigated for any kind of actionable pest, such as woodboring beetles and bark beetles. PPQ monitors these fumigations and certifies the shipment was treated according to China’s requirements. The domestic side of PPQ is to either detect pests (CAPS, FFED, etc.) or ensure that those currently in Florida do not leave the state. Many times this involves quarantine, management, and/or eradication programs, for which PPQ partners closely with the Florida Department of Agriculture and Consumer Services. For example, citrus canker and citrus black spot are regulated pests in Florida. PPQ implements monitoring and control programs to prevent spread of these pests elsewhere in the USA. Mr. Miranda received an undergraduate degree in agricultural communication from the University of Florida, then he pursued a Master’s degree in Management. For eighteen years, he worked at the Division of Plant Industry (DPI) in all facets. While working on the front lines of field operations, he gained extensive experience of pests and plant health issues. “Whenever we had a pest detection, whether it was Mediterranean fruit fly or Giant African snail, I responded as an incident commander during eradication efforts.” Over the course of his eighteen years at DPI, Mr. Miranda also worked closely with the USDA. He was the federal grant administrator for ten years, and during that time he served as a liaison between DPI and the USDA as it related to cooperative agreements and emergency response initiatives. The last two years at DPI, as Deputy Director, allowed him to work more with PPQ on strategic planning to prevent pests from entering the state. The first time Mr. Miranda became aware of the DPM program was about eleven years ago, when he met a graduate, Dr. Adam Silagyi, who was working with USDA-PPQ at the time. A couple years later, he met Dr. Leroy Whilby, who is now the chief of diagnostics at DPI. His experience with these two alumni showed the extensive training students receive in the DPM program. DPM graduates are well-qualified for almost any role in PPQ: plant health survey specialists, field technicians, biological science technicians, pest survey specialists, risk analysis and identifiers, and more. service. Finally, the USDA Presidential Management Fellows Program is a competitive two-year appointment for recent graduates which teaches leadership development skills.